The extraordinary stories of five of the last remaining Second World War RAF Bomber Command Prisoners-of-War: pilot Reg Barker, bomb aimer Charles Clarke, air gunner David Fraser, air gunner Albert Gunn and navigator Henry Wagner. ‘For you the war is over'. ‘Last of the Kriegies' tells the extraordinary stories of five of the last remaining Second World War RAF Bomber Command Prisoners-of-War: pilot Reg Barker, bomb aimer Charles Clarke, air gunner David Fraser, air gunner Albert Gunn and navigator Henry Wagner. Each veteran shares the journey they went through joining up with the Royal Air Force, their training and crewing up, and operational duties with RAF Bomber Command. We accompany them on raids over enemy territory as they fight to survive against the relentless flak, searchlights, and deadly enemy nightfighters. Eventually each airmen's next of kin receives a knock on the door and the dreaded ‘regret to inform' you telegram. Reg, Charles, David, Albert and Henry describe the circumstances in which they are shot from the sky, descending by parachute in to hostile territory, and their subsequent failed attempt to avoid capture. Interrogation follows and we hear how the downed airmen negotiate the aggressive and devious tactics employed by their captors as they try and extract secret information. Our ‘Kriegsgefangener' soon find themselves behind the barb wire of a German prison camp facing the trials and tribulations of daily life as a ‘kriegie'; the battle with hunger and frustration, the baiting and harassing of prison guards, friendships made, and attempts to break out and escape their captivity. In the final months of the war some of our POWs endure the gruelling and harsh conditions of the forced ‘Long March'. Despite frustrating delays, as the Nazi regime enters its final death throes, our airmen eventually taste the sweetness of liberation and journey home to loved ones and family. Fighting High Publishing and Bomber Command historian Steve Darlow present the extraordinary testimony of five veterans who endured and survived being shot down, captivity, degradation, and suffering. 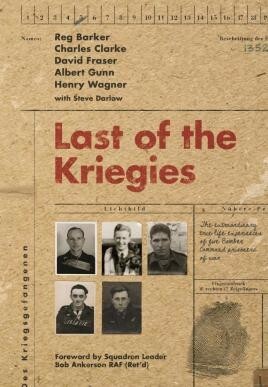 Illustrated with previously unpublished photographs and with a foreword from former Gulf War POW Squadron Leader Bob Ankerson RAF (Ret'd) ‘Last of the Kriegie's' reveals the extraordinary strength and resilience of the human spirit struggling with incarceration and the loss of freedom. Last of the Kriegies reveals the extraordinary strength and resilience of the human spirit struggling with incarceration and the loss of freedom. This is one of the best books that I have read for some time...I recommend the book as informative, very interesting and an excellent read. I award it five stars.